John 15:12-17 My command is this: Love each other as I have loved you. Greater love has no one than this: to lay down one’s life for one’s friends. You are my friends if you do what I command. I no longer call you servants, because a servant does not know his master’s business. Instead, I have called you friends, for everything that I learned from my Father I have made known to you. You did not choose me, but I chose you and appointed you so that you might go and bear fruit—fruit that will last—and so that whatever you ask in my name the Father will give you. This is my command: Love each other. We will look at these in order, the first two are fairly familiar to us, but because of the context we will spend a little longer looking at the the third. To die for someone is the pinnacle of loving action, and cultures almost universally hold it to be the highest moral ideal. But if we hold human self-sacrifice in such high esteem, then how much more must we esteem God’s sacrifice for us in Christ Jesus. God withholds nothing from us, but gives us his own Son, he is willing to share all things with those who love him (Psalm 84, Romans 8) We see this laying down of God’s life throughout salvation-history: he created us in his image, to know and love him forever, to share his life; he continued to give us life even in our sinfulness in order to save us, and so allowed himself to be blasphemed as the author or evil by those who are ignorant of his mercy, he humbled himself to be our rescuer taking on flesh to to take to himself a unlovely and unworthy people. He suffered and died for us, becoming sin that we might become the righteousness of God. He shares his life with us forever, as a bridegroom gives himself to his bride. We can begin to understand how God has loved us, he has given the gift of himself, absolutely to us. We learn also from our own experience how God has loved us, when we consider his gentleness, wisdom, patience, generosity and grace in how he leads us to him and continues to walk with us. As we reflect on these things, supremely revealed in the cross, we are like the man in Psalm 1 who thinks on God’s law day and night and bears fruit. To love in the same way. The reason for this reflection and understanding is very simple, we are called to love in the same way. Our understanding is necessary because then we can serve God as friends rather than servants, as those who know their master’s business. (vs.15) So, the second part of the Holy of Holies of the New Covenant is a life of love. For this reason Christ is constantly held up as our example (e.g. Phil 2) . We are to give ourselves absolutely to others, to live for them rather than for ourselves. Likewise, the Lord says “whoever would save their life will lose it, but whoever loses their life for my sake will save it.” So then we are to apply our experience and understanding of God’s love to the way we relate to other people. When you see the value God places on people, we are to value them. When you understand how God has forgiven you, you must forgive. When you understand that God was not content to leave you in sin, you will not say “am I my brother’s keeper”, but you will gladly lead people to Christ and correct, rebuke and exhort your brethren in love. When you understand how patiently and gently he has dealt with you, then you will do the same. When you see how God sees the heart and does not judge by appearances then you will be slow to judge the motives of others. When you see how God drew close, became man and shared our infirmites, you will draw close to others, get to know them, enter into their life that you might love with greater understanding. When you see how God covers over your sins, takes the price of them on himself that you can go free, then you will bear the emotional, physical and spiritual burdens of others. When you see how God has bound himself to us in covenant love, then you will choose to love unfailingly those whom people give up on all the time. In all of these things and more we love as he has loved us, we are laying down our lives. The third and crucial part in our participating in God’s love is to love one another; that is, to give and receive this self-giving love in fellowship with those who also know and obey Christ. Thus, Jesus says, “Lay down your life for your friends.” The love that Jesus is talking about must be practised in fellowship between Christians, not simply poured out to the world in general. We see this mutual self-giving in the life of God most clearly at Gethsemane, where the Son willingly agrees to lay down his life in obedience, but not servitude to his Father. The Father, who knew him and was glorified in him before the world began now receives from the Son all that he has to give. When we love as Christ loved and are loved in return then we are mirroring God’s very being and we become the joining place of heaven and Earth. We see the perfect intertwining of the good given to us in creation and the fulfilling presence of the Holy Spirit, the Church becomes a temple. Beautiful in it’s earthly glory, a church of mutual love is the highest good in the created order, as free, redeemed divine-image bearers give their all for the good of each other. Pouring out ourselves and being poured into by others our lives are enriched by relationship and the multiplicity of gifting and blessing that exists within Christian community. We grow in relationship as we love others as God has loved us, all the while learning and growing in understanding and being conformed to Christ’s image. We do all this imperfectly in the blessedly secure environment of the Church’s grace. Here too we experience, not by mystical encounter, but by everyday human relationships the meaning of God’s love: forgiven completely, accepted, celebrated, blessed, disciplined lovingly. These experiences of human relationship as it should be act as a lense for us to interpret God’s action in our lives and we begin to see with unskeptical eyes the vast depths of God’s love toward us. The scales of Adam’s sin fall from our eyes, and we see God through the eyes of the Son of God. So then, as we mirror God’s life we begin to reap every material good that God intended to give us through his creation. But there is more to the temple than it’s corporeal beauty: when we love like this we invoke heaven itself and invite the Shekhina of God, in the person of the Holy Spirit into our communion. The church becomes a meeting place for God’s glory and the world, a place filled not just with earthly joys but with joy inexpressible, a peace that passes understanding, the glory of God’s life. As the Holy Spirit once descended upon the Son accompanied with the words “This is my Son in whom I am well pleased”, so he now descends upon his the Son’s bride in fulness and power. What is born out of this divine/human union is none other than heaven itself. The life of the age to come fills the church and spills out in the fruit of righteousness that can only be wrought by the union of heaven and earth. Jesus is anticipating this wonderful outcome when he speaks of the greatest love, and then goes on to pronounce the future frutifulness of his disciples. 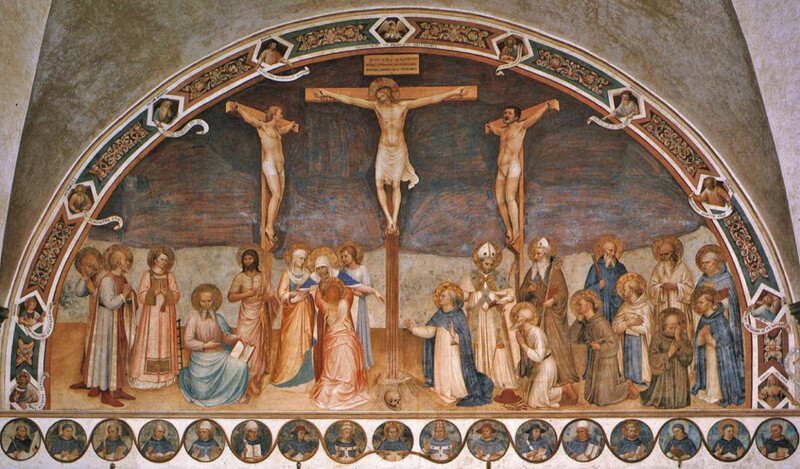 Despite the hollow cry of desertion on the cross, it is actually on the cross here that the heart of Christ burst with passion for the people chosen for him before time began. In this moment of absolute self-giving, that the new life of the church is conceived and living water begins to flow from the tree of life, now revealed as the cross. Jesus death isn’t just love for enemies, but it is also the bride-price of the Church. His love is greater quantitatively and qualitatively because he knows those whom he lays down his life for. This picture of fruitful, mutual self-giving love is even woven into creation in the institution of marriage, as a husband and wife give themselves completely to one another, they become co-creators of new life with God, and a child is conceived. The church is the fulfilment of that pattern, in heaven there is no marriage, but there will be a world filled with people who live in the love of mutual self-giving and experience the ever richer life-giving power of the Spirit in ways that minds have not conceived. But the Church is the breaking-in of that reality into now, the life of heaven breaks into this world. So the church becomes a place of true family, where the naturally inspired bonds of fellowship, generosity, support and grace break the bonds of DNA and spill across the borders of age, gender and race. So it is that we receive (in this life!) a hundredfold, homes, brothers, sisters, mothers and children. And hence Paul can say, that those called and gifted for singleness in the Church have a higher calling than marriage since they can partake of this life to come even more fully than those who are called to marriage. Some might object however, doesn’t all this sound a little inward looking? Is the purpose of the church really to love one another? What about mission, mercy and compassion for the world? The answer to that question is fairly straight-forward. Firstly, we can’t really get around the fact that Jesus says it plainly, multiple times and most clearly here in the middle of his farewell discourse (v.12 and 17 especially) – we can agree with John’s conclusion, it certainly seems to the Lord’s opinion that if we obey this command alone it is enough!” But in saying that we don’t mean that love for one another is the terminus of the Christian life, but rather that in being filled up we come to a point where we overflow! Just as the Jewish foretold a time when God’s glory would flow out of the temple sanctifying and brining life to the surrounding lands, so the church must fill up and overflow. But, of course, this leads us to an important conclusion: If we can’t love one another, those who share the same Lord and Spirit, then we cannot love the world around no matter how we try. If we can love one another then all things are possible for God. We must guard and honour this temple of the Holy Spirit above all else, as Israel treasured their temple. So, the fruitfulness of our Christian lives stands or falls on what the Lord is telling us to do here. All else flows from here, that means that true fellowship needs to be our first goal as a church. How then does this challenge us? Firstly, if this is the first time you’ve heard it then it might challenge you to rethink if you believe that the Christian religion is a private matter. The Lord is telling us it clearly isn’t. Now, within fellowship there are all types of people, God isn’t saying everyone has to be a instinctively outgoing, but he is saying that heaven will be full of other people, and we have to give ourselves, in whatever way God has enabled us, to each other. Whatever our feeling or temperament, we must become comfortable with our faith in Christ leading us into true relationship with others. Secondly, we need to ask oursevlves, am I willing to pursue this, to treasure this goal of fellowship as Israel treasured their temple, to make it our heart’s desire. Whatever we do to enable this fellowship, whether in an organised way as a church, or spontaneously in response to God’s work in our hearts, the most important thing is, do you understand why fellowship is so important? Without this understanding, our fellowship will be coincidental, our life-together empty of the Spirit’s life. But if we grasp it, then the Spirit himself will lead us into fruitful communion. Thirdly, we must be aware of the peculiar shift that placing this makes to our understanding of what particularly displeases God. The one thing that we must do, above all else, is “make every effort to keep the unity of the Spirit through the bond of peace.” (Eph 4:3) Those things that desecrate God’s temple are not imperfect doctrine, lack of zeal or flakey worship, but harsh judgement, unfair criticism, lack of grace etc. If we desecrate the Holy of Holies by wilfully refusing to love as God loves us, we become an Ichabod church, a fellowship where God’s glory has departed. Fourthly, you can’t create authentic community but you can stop it from happening. True fellowship is too rich and wonderful for any human mind to co-ordinate, which is why we have to take every church programme that aims to build authentic community with a pinch of salt. However, we can make sure that true fellowship never occurs by depriving it of vital ingredients: time, humility, grace, commitment and generosity. If we are too busy with work then we will not have authentic community. If we are too proud to associate with those who are different to us, we will not have love for one another. If we are quick to judge, or outspoken in criticism we will create division. If we are flaky in our commitment we won’t have depth or reltiaonship or trust. If we aren’t trusting in God’s abundant provision for us then we won’t be able to be generous. If we have habits that we refuse to break that keep us disconnected from others then we won’t have it. If fellowship is as central as I’m suggesting, then it is important enough to shape the major decisions we make in life. We might have to think about where we choose to live, what job we do, how much we spend on our families, what salary we are content to be on. Each of us should seek God’s wisdom on this issue, ask him and be convinced in our own heart about how you can change your life to enable fellowship to flourish. Lastly, if this all sounds like a hazy utopian dreamscape, there is an important caveat that brings the whole thing into realistic focus: While loving a stranger can be clinically simple, in contrast the love of a friend, true love, involves mess and pain and risk and ugliness. That is what a truly loving church will look like sometimes. But it is here in our mess that we most clearly reflect God’s love and invite his presence and power by the Spirit, for it is in that place, in our gracious dealing with one another’s failures that we will learn to love like Christ most clearly. In forgiving, we will learn the depths of God’s forgiveness of us. In repentance we will be reminded of our need of a saviour. In the risk that we will be reminded of the risk God took in creating us in his own image and choosing to share his life forever with us. At the heart of the Holy of Holies, is the mercy seat, the cross of Christ and it is from here, where sin abounded that grace has abounded all the more. May we be a people who overflow with the grace of our Lord Jesus Christ, and the love of God and the fellowship of the Holy Spirit!